What Five Principles Should Pastors Consider to Fulfill Their Purpose? A recent survey of 1500 pastors has shown that 13% of pastors have left the pastorate after 10 years for reasons other than death or retirement (1). Of those leaving, 37% report that they left the pastorate because of a change in calling. Another 26% left because of conflict in the church. Numerous other reasons were given for leaving and there was no shortage of problems reported that pastors encounter that lead to stress and burnout. It is also clear that public opinions about the salaries and lifestyles of pastors do not measure up to reality. Many pastors also report that living on pastoral income, if any, has put great strain on their families and finances, especially in light of the extreme number of hours they put into their ministry duties. Despite all of the gloom and doom, it can be noted that many pastors report that they were not adequately prepared and were not aware of how brutal that the calling of a pastor could be. A review of God’s Word shows us five principles that pastors should consider to fulfil their purpose. 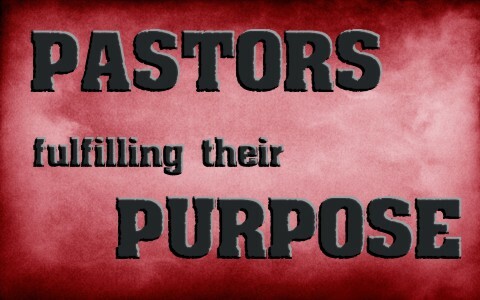 What can pastors expect in ministry? Acts 20:16-38 provides a good overview of the life and calling of a pastor as experienced by the Apostle Paul. In this account, Paul was traveling on his third missionary journey when he sailed by Ephesus on his way to Jerusalem (Acts 20:16). He sent word to the elders at Ephesus and when they arrived, he recalled with them his time there previously and how he would not see them again after he left (Acts 20:17-25). In his recollection, he described how he had been with them in all seasons, serving the Lord with all humility of mind, with many tears, and with temptations (Acts 20:18-19). He also told how he had held nothing back that was profitable to them and how he had taught them in public and in their homes repentance toward God and faith toward Jesus Christ (Acts 20:20-21). Paul also described how the Holy Ghost was leading him to Jerusalem, not knowing what shall happen, except that he would suffer for the ministry’s sake. However, he also pointed out that suffering for the ministry’s sake does not affect him as he had no regard for his life other than to finish his ministry with joy and to testify of the gospel of grace (Acts 20:22-24). He concluded by telling them that they would no longer see him and that he wanted them to mark that day that he has done what God has called him to do and he has not shunned to declare to them all the counsel of God (Acts 25-27). We see from these verses that ministry is a year round work of service that requires a deep humility, results in many tears, and has its share of temptations. A quick review of Acts 20:1-12 even demonstrates how Paul encountered opponents to his ministry, all the while continuing the work of the ministry. Of particular note was that he preached late into the night and one of the young men there fell asleep and fell off a loft. The aftermath of the fall kept Paul busy until daybreak. This shows us that in ministry sometimes unexpected things happen that makes ministry more than just a nine-to-five job. Time off is interrupted, people fall asleep during messages, and many people look to the pastor to hold everything together. In many churches, the pastor and his family clean the church, maintain the grounds, shovel snow, and take care of things because no one else is available or willing to do so. When the holiday season arrives, many pastors have had to take cuts in pay because the tithes and offerings from the congregation are redirected to personal spending or donations to other ministries. Likewise, the same often happens when insurance premiums on the property come due or there are unexpected expenses. What principles should pastors consider to fulfill their purpose? Through all of these things, Paul demonstrated that there are certain principles that pastors (and elders) should keep in mind to fulfill their purpose. First, is that there has to be a foundational understanding that pastoral ministry is a calling, not an occupation. The Bible teaches us that “the gifts and calling of God are without repentance” (Romans 11:29). While this verse was used in the context of God’s gifts and calling of Jews and Gentiles, the principle remains the same. If God has called someone to the pastoral ministry, then He does not change His mind. Therefore, it is important to discern if God has really called someone to the pastoral ministry or not. Sadly, too many people are attracted to the pastoral ministry, but are woefully unprepared for what it entails as part of a calling. When things do not work out the way they envisioned it would, they often get discouraged and their ability to do the work of the ministry wanes. Paul reminded Timothy of this very fact in 2 Timothy 1:1-9 when he said that when God gives someone the gifts and calling of the pastoral ministry, that there is a certain mindset that prevails. This mindset is what enables a pastor to fulfill their purpose, no matter what they encounter. A pastor must take heed unto himself and guard himself (Acts 20:28; 1 Timothy 4:1-16). A pastor must take the steps needed to ensure that he stays strongly connected with God’s Word and good doctrine while refusing false teaching and gossip so that he may maintain himself in Godliness. This protects and guards the pastor from influences and temptations that will adversely affect his ability to continue the work, even when it seems like the whole world is against him. In doing so, he will remain strong and continue to be effective in ministry. A pastor must stand guard over the flock (Acts 20:29-30; 2 Timothy 3:1-8). It is common to find all sorts of heresies and false doctrines brought into the congregation in a variety of ways. Often, it comes in the form of well-meaning church members who bring in the teachings of popular Christian speakers or authors that promote theological concepts and practices that are not Biblical. Other times, in desperation to expand the ministry, people are put in positions of authority or teaching that are not thoroughly vetted or trained. Before long, their actions and teachings cause damage to the flock and in some cases even lead to church splits. A pastor must seek the overseeing presence of the Holy Spirit to properly oversee the church (Acts 20:28). Too often, pastors lead and make decisions based on their own perception of what is the right thing to do instead of prayerfully seeking God’s will in the matter. Proverbs 18:13, 15, 17, 19 demonstrates that hasty decisions often cause decisions and actions that harm others. Instead, pastors should seek the truth of the matter and prayerfully seek answers from God’s Word on what they should do. While this may take more time, it gives the pastor a confidence to know that God has spoken on the matter through His Word. A pastor should feed the church of God (Deuteronomy 8:1-3; Acts 2:42; Acts 20:28; Ephesians 4:11-14; 1 Peter 5:1-4). A pastor must ensure that the flock receives what it needs to grow in faith and knowledge so that it can withstand the winds of doctrine. Messages should have a life application that the flock can understand and embrace in their lives. When giving Biblical counsel, the advice given should be based on solid Biblical principles so that the results are Biblical. Discipleship must be provided so that the flock can grow to have God’s Word as a daily central part of their lives. A pastor should remember that the church belongs to Christ (Acts 20:28; 1 Corinthians 6:19-20; 1 Corinthians 7:23; Ephesians 1:12-24; 2 Peter 2:1). Too often, pastors adopt the mentality that they own the church. This attitude leads to actions and decisions that fail to recognize the church as the bride of Christ. The pastor must make sure that he encourages the congregation to fall in love with Christ above all else because of what he did for them (1 John 4:19). The pastor is held accountable by God for how he carries this out and in doing so will enable the church to follow his leadership (Hebrews 13:17). To do this, as Paul mentioned, a pastor must seek what is best for the flock as Paul did in Acts 20:31-36). When a pastor fully embraces these principles from Scripture, like Paul in Acts 20:36-38, the flock will love him in the same way they love Christ. Pastoral ministry is a year round work of service that requires a deep humility, results in many tears, and has its share of temptations. Acts 20:16-38 provides a good overview of the life and calling of a pastor as experienced by the Apostle Paul. There has to be a foundational understanding that pastoral ministry is a calling, not an occupation. Paul pointed out that there are principles that need to be kept in mind so that pastors can continue to fulfill the purpose. A pastor must take heed unto himself and guard himself. A pastor must stand guard over the flock. A pastor must seek the overseeing presence of the Holy Spirit to properly oversee the church. A pastor should feed the church of God. A pastor should remember that the church belongs to Christ. When a pastor fully embraces these principles from Scripture, the flock will love him in the same way they love Christ. Related reading for you: What Does the Bible Say About the Duties of a Pastor? (1) “The One Percent: Why So Few Pastors Quit A ‘Brutal Job’” Christianity Today, Retrieved from: http://www.christianitytoday.com/gleanings/2015/september/one-percent-why-so-few-evangelical-pastors-quit-lifeway.html, (2015). Previous post: How Does Satan Try To Attack Marriages? Next post: What Does The Term Mystery Mean When Used In The Bible?